EXAIR's new hazardous location Cabinet Cooler systems have achieved the UL classified designation for Div 1 environments. 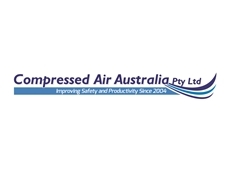 Compressed Air Australia presents the new Catalogue 32 from EXAIR featuring a complete range of engineered solutions for common industrial conveying, cooling, cleaning, blowoff, drying, coating and static electricity problems. 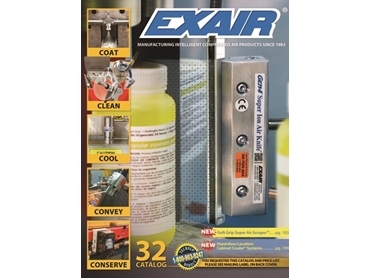 EXAIR's Catalogue 32 is a full colour technical guide that serves as the source for compressed air savings and safety; the catalogue features new Super Air Scraper Nozzles, Soft Grip Super Air Scraper Safety Air Guns and Hazardous Location Cabinet Cooler Systems. 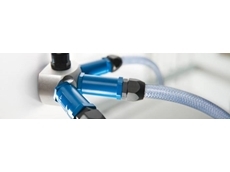 The Super Air Scraper is a patent pending nozzle used to eliminate stubborn debris from work or machine surfaces. This 2" flat nozzle utilises a corrosion resistant scraper blade to provide the required leverage to get underneath and scrape away fixed debris. 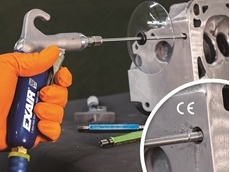 The Soft Grip Super Air Scraper is a safety air gun designed to help remove stubborn debris. 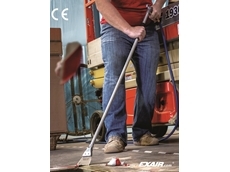 This air gun is available with 6" to 72" (152mm to 1829mm) long extensions to provide the strength and durability necessary for some of the toughest cleaning challenges. 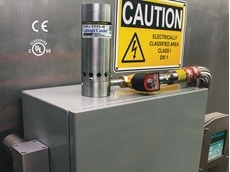 The new Hazardous Location Cabinet Coolers are engineered and approved for use upon purged electrical enclosures found within classified areas. These UL classified systems use vortex tube technology to produce up to 5,600 Btu/Hr (1,411 Kcal/hr) cooling power, creating a low maintenance solution for cooling HazLoc purged cabinets. 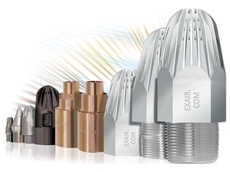 EXAIR products help companies conserve compressed air, reduce dangerous noise levels and eliminate harmful dead-end pressures. Detailed technical explanations, performance data, application photos and dimensional drawings are provided for each product in the catalogue. Get your free copy of EXAIR’s Catalogue 32 by calling Compressed Air Australia on 1300 787 688 or email info@caasafety.com.au.